Masochistic stat-chasers will find much to enjoy, but Blackguards varied combat is no substitute for a fully-formed RPG. Much of my time in Blackguards was spent waiting. I waited for my turn, as enemies slowly plodded around hex-grid maps. I waited for tactical diversity, yearning to unlock the more interesting attack options. Mostly, I waited for earnest fantasy stereotypes to finish performing their questionably accented dialogue and unlock the next fight. 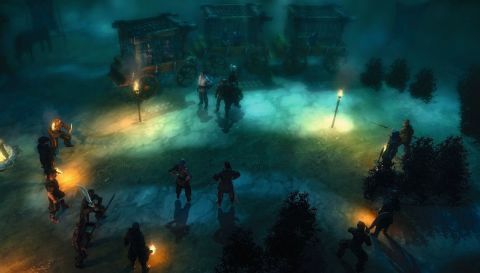 Based on The Dark Eye pen-and-paper rule-set, Blackguards is a turn-based RPG so focused on combat that it's more fantasy XCOM than fantasy Fallout. At the start the character you've created is convicted of murder. Escaping from prison, he or she must team up with a band of roguish misfits to figure out who – or what – was really responsible. Yet that mystery isn't much more than a flimsy tool to link each battle. Most of the game is spent staring at hex-grids, painstakingly moving up to five characters into position to activate a selection of ranged or melee attacks, spells and defensive stances. It's engaging but clunky, controlled via a sluggish interface. The encounters are imaginative and varied. Each map has a different layout and usually a smattering of interactive objects. Stacked crates can be pushed over to crush enemies, swamp gas exploded, levers activated for potentially deadly effects. The best of these let you cleverly subvert the battle space, turning a fight against overwhelming odds into a satisfyingly achieved advantage. Those victories are hard fought. The difficulty means you'll see many of Blackguards' maps multiple times. Regularly, I found myself cursing the random chance attack rolls. The slow pace of combat makes such repetition frustrating, especially when, thanks to luck, otherwise sound tactics result in a restart. The rest of the game takes place entirely in menus and in towns, presented through animated point-and-click screens that play like the world's least satisfying hidden object puzzle. Can you find the covetous dwarves? Yes, because there's an icon over their heads. Each town visit is accompanied by the same basic actions: heal, equip, sell, upgrade. In the second chapter, the game goes so far as to abandon the linear questing entirely, instead taking you on a gladiatorial sojourn of wearying back-to-back sortees. Things finally open up in chapter three, but even then, you're only really choosing how many extra side quests you want to fight. Such singular focus is almost admirable, but it means there's little to engage you between combat. The best tactical games enhance their action with difficult decisions that give a sense of purpose to battles. However, this is where Blackguards' underserved RPG elements do the most harm. Its idea of a compelling conundrum isn't to choose the fate of the world, or even your squad, but whether you should spend 200 points on a marginal stat increase to shortsword proficiency.